In a bid to provide greater benefits of Pay Per Second tariff with lower call charges to its CDMA mobile subscribers across all telecom circle, TATA Indicom the CDMA mobile service brand of TTSL finally joined bandwagon of Per Second Billing. Now Tata Indicom Prepaid Subscriber can able to make Local and STD calls to any phone, any network with in India at just One Paisa per Second with the recharge of Rs.53 while new customer can avail the same benefits with a starter kit of Rs 99. 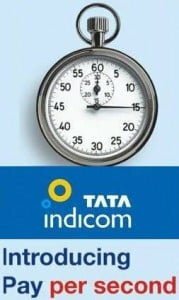 Tata Indicom Pay Per Second Plan also comes with ‘3 on 3’ bonus offer where in if subscribers make a continuous call for 3 minutes then they can avail the next 3 minutes absolutely free on the same call. The operator also claims that its ‘Pay Per Second’ with ‘3 on 3’ bonus offer not only provides a competitive price point with one paisa per second for all calls, but also a bonus proposition where in if the customer makes a continuous call for 3 minutes, he/she can avail the next 3 minutes absolutely free on the same call. The combination that makes the offer all the more unique is that it not only provides a low call rate with one paisa for short calls but, is equally cost effective for long calls. More Information just call Tata Indicom customer care number of your circle. THIS IS VERY GOOD POWER PLAN. POWER CONTROLS EVERY THING. THANKS. please tell me … about that..